Place the pork belly in a large sealable plastic bag. Mix 3 cups of the water with the salt and sugar, and pour it into the bag. Seal tightly and let marinate 12 to 24 hours in the refrigerator. When ready to cook the pork belly, preheat the oven to 300 degrees Fahrenheit with the rack in the middle of the oven. Remove the pork belly from the brine and place in a small baking dish. Add the chicken broth and remaining 1/2 cup of water. Cover tightly with aluminum foil and roast for 2 to 2 1/2 hours until pork belly is fork tender. Remove the aluminum foil, increase heat to 450 and roast for about 20 minutes until the top has crisped and browned and the inner fat has mostly melted. Remove from oven and let cool. Once cool enough to handle, slice into 1-inch pieces. To a saucepan set over medium-low heat, add the butter. Once it has melted and is bubbling, add the garlic and cook until fragrant, about 1 minute. Add the soy sauce, sherry vinegar, agave syrup and orange juice, and stir to mix well. Poke a few holes in the habanero with a pairing knife and add it to the sauce whole. It will release the flavor of the pepper without making the sauce super spicy. Bring to a simmer and let cook about 8 to 10 minutes until the sauce thickens and coats the back of a spoon. In a large cast iron pan set over medium-high heat, heat the peanut oil. Add the brussel sprouts, season with salt and pepper to taste, and cook for about 12-15 minutes until crispy and browned on the outside and tender inside. 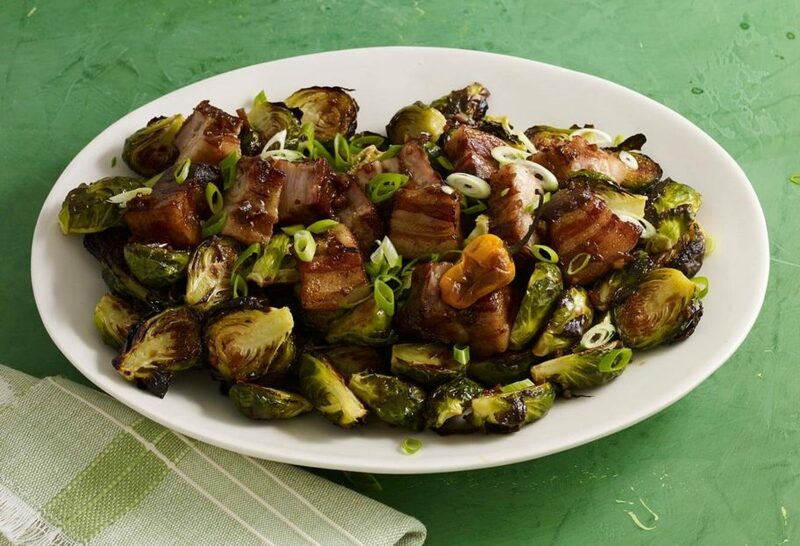 Plate the brussels sprouts on a large platter and top with the pork belly, drizzle with the sauce, and garnish with freshly sliced scallions. I watched your Thanksgiving episode yesterday on pbs and we are making your stuffing and brussel sprout recipes for our family’s dinner. I’m so excited to see how everybody’s reaction to the wonderful flavors that are sure to come. Thank you for the different spin that you are teaching for making an interesting and flavorful thanksgiving dinner!! Thank YOU Mike. Have a yum Thanksgiving. Aww thank you Michael! Have a great Thanksgiving. We watched your show yesterday. I love your take on Thanksgiving and who all y’all invite over. Our house is a fan of brussel sprouts. That is, as long as they are not steamed. We roast them, saute them and even shred them for slaw dishes on occasion. What I found most interesting was the sauce that you made for this dish. Unfortunately I am the heat lover when it comes to peppers. I am happy to say that everyone is onboard with giving this a try just as you presented it. Well okay, maybe not exactly as such. I couldn’t get my hand on any pork belly today. I am going to substitute is with sauteed alligator meat instead. The next time we make it, it will have pork belly in it. Alligator meat…oh let me know how it goes, David. Sounds like a great take on the brussel sprouts. What I think I will do is make the sauce and refrigerate it separately, make the brussel sprouts that morning, and just combine it all in a crockpot an hour before. Thoughts? You can make the sauce ahead, but I recommend you make the brussel sprouts an hour before. Have a great party, Sara! Pati: I just caught your show for the very first time on KPBS. Where have you been my whole life? I want to make your meatballs recipe that you made for your son. Your son is adorable. Thank you. So glad you found my show, Hang! Here’s the meatball recipe: https://patijinich.com/recipe/meatballs-in-guajillo-sauce/ Enjoy! This recipe is a real winner at my house. I’ve come back time and time again to recreate this dish. Now, here I am making it Thanksgiving morning by request. I’ll have to modify the pork belly part as I domt have time to brine, but it’s such a great sauce and overall dish, I’m sure no one will mind. That is for this delicious dish, Patti! And Happy Thanksgiving! I hope you had a Happy Thanksgiving too and that everyone loves the brussel sprouts! Hi pati! !I love watching your show especially when you guys are in San Miguel de allende near my parents home town leon,gto. Thank you for tuning in Gilbert!!! For the brussel sprouts you don’t need to rinse the pork belly…just take it out of the brine and put it in your baking dish with the chicken broth and water. Hola Pati, I absolutely Love your style, attention to details and culture..I am going to make this recipe but Im going to smoke the Pork belly for a couple hours. Should I bake it at a lower temperature to maintain the moisture?..Thanks for your bubbly inspiring personality! Your show is La Mejor!! Dont stop your passion, it makes me smile. Gracias Rich! Yes, I think baking it at a low temperature for a while is best. Hi ! Pati have to tried this w pork belly can one substitute the Pork belly? Love everthing from your kitchen faithful watcher of your show everyday, Thank you for your kindness for wonderful recipes and the smile brightens the kitchen. Sure! You can substitute with bacon or if you want to make it vegetarian you can leave out the pork belly. Oh, the website will be in Spanish as well in just a few weeks… hang in there with me! This is probably one of the best ways to get my children to eat a cruciferous vegetable that doesn’t include cheese. I really love your show and your wonderful personality Pati. I have transformed my vegetable patch with nearly all things mexican. So happy to hear this Belinda! I hope your garden is growing beautifully, and that your children are enjoying all of the veggies! We have been watching your shows on SBS Television in Australia, and SO LOVING your show and recipes, as well as your lovely smile. We shall be giving this recipe a go, as we love Pork Belly and Brussel Sprouts. Thank you for your lovely message Selma and Paul! Thanks sharing with us your delicious recipes! I need this yesterday and the flavor was awesome! I used low sodium soy sauce and serrano pepper instead of habanero. But The sauce did not thickened after 20 min boiling. Any idea why? I want to make this again! Thank you for your most delicious recipe! And so as the Thanksgiving turkey with all the goodies.Where I come from we do the earth oven and wrap food in banana and breadfruit leaves. I just made this for dinner. It was amazing!! Thank you! Hola Pati! A mi mamá y a mi nos encanta tu programa! Queremos hacer todas tus recetas de Thanksgiving, se ven riquísimas! Saludos desde Kansas City, Kansas!